Online retail giant Amazon is buying Whole Foods in a $13.7bn (£10.7bn) deal that marks its biggest push into traditional retailing yet. Amazon, which has long eyed the grocery business, will buy the upmarket supermarket for $42 a share. Investors greeted the deal as game-changing for the industry, sending shares of rival grocers plunging. But Whole Foods, which had been under pressure, climbed. 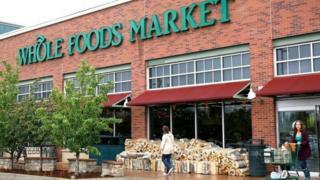 Founded in 1978 in Texas, Whole Foods was a pioneer of the move towards natural and organic foods. It has grown to more than 460 stores in the US, Canada and the UK, and employs about 87,000 people. "Whole Foods Market has been satisfying, delighting and nourishing customers for nearly four decades - they're doing an amazing job and we want that to continue." Whole Foods has faced dissatisfaction from investors, amid falling same-store sales and increased competition. Last month, the company named a new chief financial officer and new board members. In April, activist investor Jana Partners called the firm's shares undervalued, noting "chronic underperformance". The price being paid by Amazon marks a 27% premium to the level Whole Foods' shares closed at on Thursday. The $13.7bn value includes assumption of the grocer's debt. The takeover deal - the biggest in Amazon's history - is expected to be completed in the second half of the year, pending approval by shareholders and anti-trust regulators. Whole Foods boss John Mackey said: "This partnership presents an opportunity to maximize value for Whole Foods Market's shareholders, while at the same time extending our mission and bringing the highest quality, experience, convenience and innovation to our customers." The Whole Foods brand will continue. Mr Mackey is expected to stay on as chief executive. Whole Foods stock soared 29% on the news. Amazon shares closed up 2.4%. Neil Saunders, managing director of GlobalData Retail, said the deal should give the grocer financial breathing room, while making it more competitive online and improving its supply chain logistics. The takeover also makes Amazon an instant player in the grocery industry, where it has operated at the fringes since launching its food delivery service Amazon Fresh in Seattle in 2007. Whole Foods and Amazon were staying quiet on Friday about how they might introduce technology to stores, merge their supply chains, or cross-sell Amazon products. Brendan Witcher, principal analyst at Forrester Research in Boston, said any changes are further down the road. • Lower prices? Amazon has a long history of deferring profits in favour of winning customers with low prices. It could try a similar strategy at Whole Foods, now knocked by some as "Whole Paycheck". • Techie shopping? Amazon is also interested in how technology can make shopping more efficient. The firm's Alexa robot maintains shopping lists and Amazon is testing a convenience store in Seattle that operates without check-out lines. "There is an inherent logic in the move which, in our view, brings benefits to both businesses," Mr Saunders wrote. Shares of other supermarket chains took a beating. The industry has already seen significant consolidation, with smaller players wiped out. Kroger shares fell more than 9 %, Target plunged 5% and Costco Wholesale Corp. dropped about 7%. Walmart, which announced its own $310m deal to acquire the online clothing company Bonobos, slid 4.7%. The reaction spread to companies in Europe. Dutch retailer Ahold Delhaize fell nearly 10%. Mr Saunders said the deal is "potentially terrifying" for other companies. "Although Amazon has been a looming threat to the grocery industry, the shadow it has cast has been pale and distant," Mr Saunders wrote. "Today that changed."